This week's recommended free online movie is the 1953 science fiction horror film Donovan's Brain, starring Nancy Davis (later Nancy Reagan) and Lew Ayres, and directed by Felix Feist. The basic plot: a multi-millionaire's airplane crashes in the desert, a scientist keeps his brain alive in a tank, and there are unintended consequences (of course)! The movie is based on Curt Siodmak's best-selling 1942 novel by the same name. While Siodmak is probably best known as a Hollywood screenwriter for horror movies like The Wolf Man, he also wrote a number of science fiction novels. And he wasn't just interested in cheap thrills. In a 1997 interview, Siodmak talks about how took pains to assure scientific accuracy in his novels. I have a trick with writing sci-fi [. . .] . In all these books there is a tremendous amount of research involved. I pick up the telephone and call the most important scientist I can think of in that field in America. So far they have all worked with me because they all are frustrated writers anyhow. If someone is writing [a book] for them, then they can correct it, which makes them feel they wrote it. I siphon off years of knowledge and research from those people for a small fee, or for a percentage of the book, whatever the case. But at the end, I have a story that is scientifically right. Apparently not one to mince words, Siodmak doesn't paint a pretty picture of scientists as wanna-be writers. I suppose it's a small consolation that he compensated them for their time and expertise. 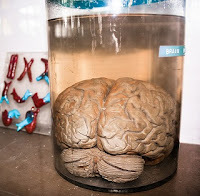 In the novel version of Donovan's Brain, the brain is kept alive in a mixture of "blood serum" and human brain "tissue ash". That does appear to be based on the latest science in organ culture at the time the novel was written. In the 1930s aviator Charles Lindbergh worked with biologist Alexis Carrel to develop devices to keep organs alive in culture. At the time, blood serum was one of the standard components of organ culture medium. Their work was widely known even outside scientific circles, and even making the cover of Time Magazine in 1935. I couldn't find any indication that Siodmak had talked to scientists about how to grow a brain in a tank, but it seems that he could have derived inspiration just from the science news in the popular press. In researching that book, I worked at this hospital where they had 2,500 retarded children, insane and old people, too. I remember two old guys asking me, "Tell me, sir, are we going to lunch or coming from lunch?" They didn't know which. But they remembered what they had done when they were eight years old. So we might have a greater amount of RNA—ribonucleic acid—when we are young. As we get older, that substance dries up. That's why we can't learn new languages so easily when we get older, but kids pick it up right away. The growing process of the brain is based on RNA, which is why we learn so fast as kids. Even memory—and also what is right, what is wrong—is information you pick up easily as a child. So what about the movie version? 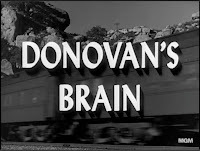 There were three mid-20th century movies based on Donovan's Brain. Apparently Siodmak didn't care much for any of them. He claims he didn't even bother to watch the 1953 Feist-directed version, because in it "God destroys Donovan's brain with a thunderbolt." So be warned that the movie has less scientific plausibility than the novel. Still, it's a decent B-movie for this holiday weekend. Watch Donovan's Brain at Hulu.com. Note: this movie may only be available in the US. Listen to a 1944 reading of Donovan's Brain, plus a parody by Orson Welles, on the old time radio show "Suspense".